A Guns N’ Roses live album is probably never going to happen. Axl and Slash hate each other, and even if they say that there’s gonna be a Guns N’ Roses concert, there’s little chance it will actually happen, and that’s even if the band was on speaking terms. Thus recording a GNR set was always going to be impossible. That said, of the two main creative figures of GNR, it’s been a nice surprise that the true workhorse, and the likable, approachable one has been Slash, who could have easily rested on his ‘80s metal guitar mastery, devolved into top-hatted self-parody, and played bitchin’ solos outside a desert church until he died at age 38 under mysterious circumstances in a Phoenix hotel room. Instead, he’s kept working, fronting numerous bands, contributing guest shots, writing an autobiography, and touring, up to and including live albums, like this one Made in Stoke 24/7/11. 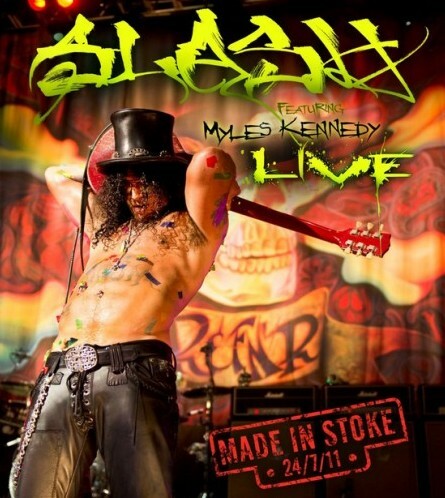 Recorded in Stoke-on-Tent, it’s Slash’s first wide-release live collection, but the only one recorded in his hometown (which explains the weird Euro numbering title). Yeah, Slash is British, technically. Fun fact. On this double set out now on Armoury Records, Slash is the star of the show, as he always kind of sort of and should have been with GNR. But Slash doesn’t sing, either because he can’t or just doesn’t want to. So he put together his own serviceable Coverdale/Page 2K situation, hiring Myles Kennedy to do the vocals. This isn’t the first time Kennedy has replaced a polarizing lead singer—he’s best known as the singer for Alter Bridge (which he joined after declining an offer from Slash’s Velvet Revolver), the band best known for being the band that the rest of the guys from Creed formed after they finally tired of Scott Stapp. Even if you could get a Guns N’ Roses live album, it would never quite capture the legendary raucousness of those shows. But this album, which is just Slash effortlessly nailing his favorite songs for a couple of hours to the thrill of an appreciative crowd, is actually pretty good. Slash knows where his bread is buttered, and he, the legendary guitarist is the star of the show. Slash and Kennedy turn in a super fan approved greatest hits tour encompassing Slash’s whole career, not just GNR. So yeah, there’s “Sweet Child O’ Mine” and “Nightrain” and “Patience” and a stellar set-closing “Paradise City,” but there’s also Velvet Revolver’s “Slither” and Slash’s Snakepit’s “Beggars & Hangers On.” The majority of the tracks are highlights from Slash’s first and only solo album which came out just last year: “Starlight,” “Back From Cali” (which Kennedy sang on the LP version), “Doctor Alibi” (wherein Kennedy stars down the daunting task of filling in for the song’s original singer, Lemmy Kilmister), and “Promise,” among others. Basically, it’s like a way metal Supernatural, and Kennedy has to fill in for Axl Rose, Scott Weiland, Eric Dover, and others, every night, and on a live album for the ages. Even if he couldn’t pull it off, we’re all her for Slash, but Kennedy plays off Mr. Hudson quite nicely.